In medium bowl, pour boiling water on gelatin; stir until gelatin is dissolved. Stir in yogurt until melted and smooth. Cover; refrigerate about 1 hour 30 minutes or until thickened but not set. Meanwhile, heat oven to 350°F. Place cereal in food-storage plastic bag; crush with rolling pin to make 1 cup. In small bowl, stir cereal and butter until well mixed. Press mixture firmly in bottom of ungreased 8-inch square pan. Bake 10 minutes or until crust is light golden brown. Set aside to cool. Beat gelatin mixture with electric mixer on high speed 7 to 8 minutes or until doubled in volume. 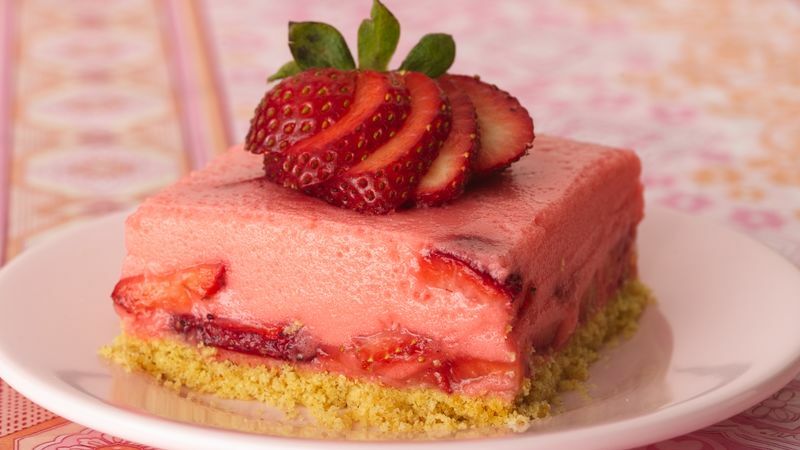 Fold in sliced strawberries; pour over crust. Cover; refrigerate about 1 hour or until firm. To serve, cut dessert into squares. Garnish each serving with strawberry fan. You can use 1 (6-oz) container of Yoplait® Original 99% Fat Free strawberry or French vanilla yogurt instead of the yogurt in the recipe if you like. An easy way to remove the green top (hull) of a strawberry before slicing it is to push one end of a plastic drinking straw from the point of the berry through to the top to pop off the green cap. To make strawberry fans, wash berries and pat very dry. Place each berry on its side and make cuts with a sharp knife, 1/4 inch apart, from the point to close to the green top. Spread the slices.